At the turn of the 20th century, people flocked to Los Angeles in pursuit of that California dream: year-round sunshine, wide-open spaces, new opportunities. And, of course, the beaches. But that piece of the dream wasn’t always available to everyone. African-Americans who came to Southern California in the early 1900s struggled to find a place to safely and comfortably enjoy the surf and sand—even though California had laws on the books as early as the 1890s that said beaches were public resources open to all residents, regardless of race. Here, we look at two historic African-American beaches in Los Angeles County: Bruce’s Beach in Manhattan Beach and the Bay Street Beach, sometimes referred to as the Inkwell, in Santa Monica. 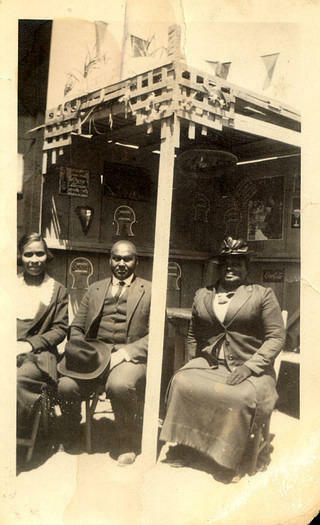 Willa Bruce and her husband, Charles, purchased land in Manhattan Beach, California, in 1912 and established a small resort for African-American beachgoers. It became known as “Bruce’s Beach.” There was a bathhouse, a lodge, a dance hall, dining options, and spaces for outdoor recreation. “They brought a lot of joy to people,” Jefferson says. But many residents in Manhattan Beach were opposed to the Bruces’ resort, filing complaints with the city. The landowner next door enlisted constables to patrol his property. He claimed he owned the shoreline and put up ropes to block access to the water from Bruce’s Beach, forcing visitors to walk nearly a mile down the coast in order to wade into the ocean. “From day one, there was resistance to [Willa Bruce] opening her business,” Jefferson says. The city eventually passed an ordinance prohibiting public bathhouses along the beach—including the Bruces’, which at the time was the only public bathhouse in the area. The city later passed ordinances prohibiting people from changing their clothes in their cars or in tents. In the mid-1920s, citing a desire to build a public park on the land, the city took the Bruces’ property through eminent domain. 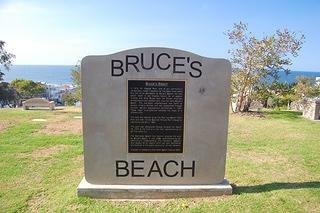 There were protests, and a group of African-Americans organized a “wade-in.” But to no avail—Bruce’s Beach was no more. The resort was razed. The land remained vacant for the next three decades and changed names a few times before the park was finally built. Head to this section of Manhattan Beach today, and you’ll find a sign marking the area as “Bruce’s Beach” once again. There’s also a plaque detailing the site’s history—though, Jefferson says, the plaque has inaccuracies. These efforts came after city of Manhattan Beach voted to rename the beach back in 2006. A dedication ceremony was held in 2007. Willa Bruce (right) with her son Harvey (center) and his wife, Meda (left) under a portable shade and tent structure at Bruce's Beach. 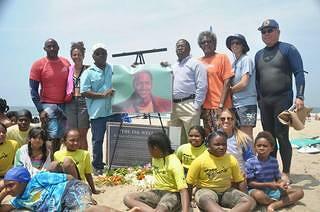 A commemorative marker was installed at Bruce's Beach in 2007. Bay Street Beach, or "The Inkwell"
Many African-American beachgoers referred a stretch of coastline south of Pico Boulevard in Santa Monica, California, as the Bay Street Beach. Others called it “the Inkwell.” The latter term was most certainly derogatory, referring to the skin color of those who used the beach, but some, Jefferson says, reclaimed the term and used it as a badge of pride. While the boundaries of Bay Street Beach shifted through time, it was a popular beach for African-Americans from the early 1900s to the 1960s. It was accessible by streetcar, and it was near a thriving African-American community centered around the Phillips Chapel Christian Methodist Episcopal Church (built in 1908) at Fourth and Bay streets and a host of other African-American businesses that were eventually established. The beach was a gathering place, with a bathhouse, cafes and restaurants, tennis courts, volleyball nets, and other recreational opportunities. “It became a place of refuge,” Jefferson says. In the 1920s, a group of African-American investors, including prominent attorney Charles Darden, sought to develop a “first-class resort” along the beach at Pico Boulevard. The plan was met with protests, and the city blocked the development from happening. After the investment group abandoned its plans, the property was purchased by white developers. Their plans for a resort was approved, and the now-iconic Casa del Mar hotel was built. As other similar resorts were built in the area, Bay Street Beach was pushed further south. But it continued to be enjoyed. It’s where one of the earliest documented surfers of African- and Mexican-American descent, Nick Gabaldón, got his start in the 1940s. Walk around the area today, and you’ll see a commemorative marker at Bay Street and Ocean Front Walk, near a cluster of palm trees. Jefferson wrote the text on the marker. And there are also annual events, like Nick Gabaldón Day and Coastal Cleanup Day, which have taken place around the monument for the last several years. These efforts are organized by local groups like Heal the Bay, the Santa Monica Conservancy, and the Black Surfers Collective, as well as Jefferson, and they promote coastal conservation while also raising awareness of and celebrating the historic beach. Celebrating Nick Gabaldón Day at Bay Street Beach in Santa Monica.